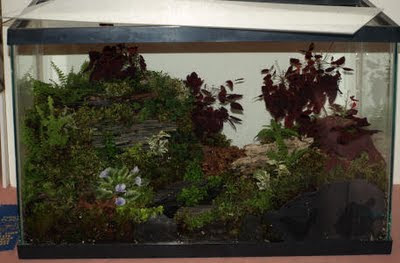 Try adding a few slopes and peaks to the landscape in your next large-scale terrarium. Maybe even a mini-creek? Since this terrarium could become quite heavy once planted, Olive has tried to save weight by not filling large spaces with rock or soil when not necessary. The two large blocks placed in the back corner of the tank, for example, are actually pieces of Styrofoam, painted black. These will provide the desired height to the landscape without the weight of rocks, or soil (which would become heavy once watered). The Styrofoam as other advantages as well. 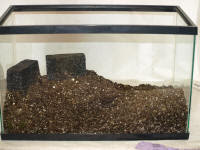 Since it is solid, unlike our potting soil, it won't collapse, or shift, if (when) the tank is moved or tipped, and we can secure other materials (like our rock wall) to it.